Dogs must have dog food to live long and healthy lives. Specially made dog food is a must; it is not enough to feed your dog scraps all the time —they need the nutrients especially formulated for them. Our dog food range caters for all kinds of dogs including food for specific breeds, and we stock dog food from all major and well-known suppliers including Royal Canin, Red Mills, Orijen, Bakers, Wagg, Applaws, Hill’s, Fish4dogs, Chappie, Acana, Arkwrights, Burns, Gain, Naturediet, Skinners, Burgess and Arden Grange. For those ‘in-between-meals’ moments, we have a wide supply of dog treats including rawhide treats, biscuits and chocolate treats from many producers like Nylabone, Pedigree and Kong. 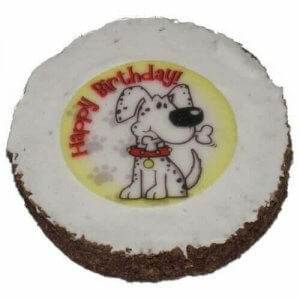 We even stock birthday cakes and treats.